Standard serving sizes are based on 1”x2” slices. 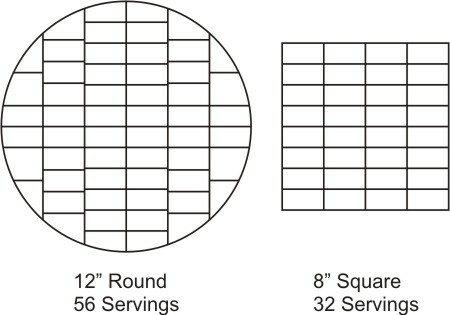 It is easier to cut round cakes into a grid like pattern like below rather than wedges. You will find you get more pieces this way too. First slice along the cake 2” in all the way across. Then cut 1” slices and serve. Repeat right across the cake. As most people are not used to cutting cakes to exact measurements, the serving sizes are approximate only. Please also note that carved/3D cakes can be quite tricky to give an exact number of servings. I will always endeavour to provide you with a cake that corresponds with your requirements, but sometimes the design only allows a set amount of cake. Please discuss this with me upon ordering.